Since 2009, an assortment of famous Irish musicians have spent their Christmas Eve busking in support of The Simon Community, an organization that provides support for the homeless in Ireland. 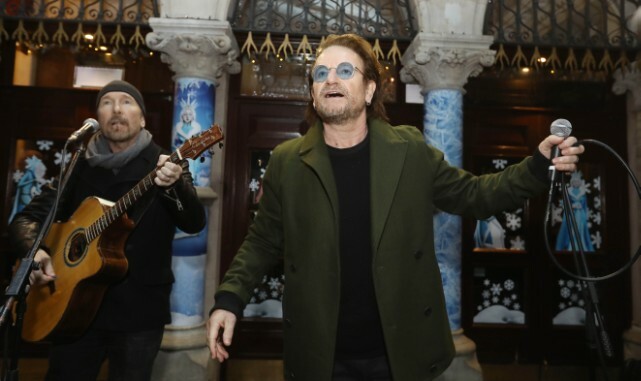 As Rolling Stone and The Guardian point out, the tradition continued in 2018, with U2’s Bono and the Edge participating for the first time since 2015. The bandmates were joined by figures including Glen Hansard, Damien Rice, and Imelda May at a makeshift stage on Grafton Street in Dublin. The U2 crew’s contributions to the night included a run through “Love Is Bigger Than Anything In Its Way” from Songs Of Experience and some assorted holiday fare. After performing two traditional hymns, “O Holy Night” and “O Night Divine,” they were joined by the whole group of performers to belt out Darlene Love’s classic “Christmas (Baby Please Come Home).” It looks like it was an especially buoyant and ramshackle rendition of a basically perfect song. Check out footage below, and to those who celebrate, have a wonderful Boxing Day.